Could there be anything that screams 'Summer!' more than this? The instant I had this idea I knew I would be making it, it was just a question of when. That time came with Sunday lunch with N's mum and it was the perfect end to a meal of perfectly cooked roast lamb. 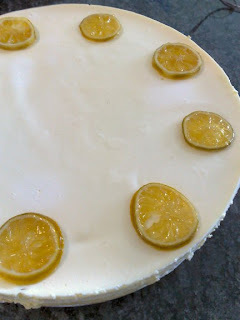 I've made a lime cheesecake for years now but this recipe will probably become the new go-to cheesecake. I didn't get a great shot of the layers due to bad light but the contrast between crunchy biscuit base, tangy lime custard, creamy filling and smooth sour cream topping was absolutely sublime. 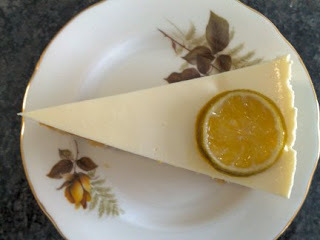 Then the candied lime slices on top gave it an extra zesty boost! There are no other words ... just make it!!! Preheat oven to 175 degrees Celsius. Position a rack in the center of the oven. In a small sauce pan, combine all ingredients for the lime custard and whisk over medium heat until it thickens and bubbles around the edges of the pan. Let bubble about 30 seconds then remove from heat to cool slightly before scraping into a bowl to cool to room temp. In a food processor, crush the biscuits until they form fine crumbs. With the motor running drizzle in the melted butter and process until combined. Press mixture onto the bottom and about half way up the sides of a 9 x 3" springform pan which has been wrapped tightly with layers of aluminum foil. Place in the fridge to set. In the bowl of a mixer, combine cream cheese, sugar, eggs, pulpy lime juice, and zest. Mix until smooth and creamy. Once the crust is set (approx 20 minutes), carefully spoon the lime custard into the bottom and smooth evenly. Then spoon the filling over the lime custard, again carefully smoothing to completely cover the first layer. Set the springform pan inside the large baking pan and then place on the oven rack. Slowly pour very hot water into the large baking pan until the level reaches about half way up the side of the springform pan. Bake for 45 minutes. It should not be puffy and center will move slightly when shaken. Combine the sour cream with the 3T of sugar and then carefully spread over the top of the cheesecake. Put it back in the oven and bake for an additional 10 to 15 minutes, just until the topping is set. Remove the springform pan from the water bath and let cool on a rack for at least 10 minutes. Using a sharp knife, carefully run the knife around the edge of the pan to loosen it a bit. Then cool completely at room temperature. Cover the pan tightly, and refrigerate overnight. Release the sides before serving. Serve cold. Bring a medium pot of water to the boil. Slice the limes into thin rounds and blanch the slices in boiling water for 2 minutes. Drain and repeat. Using the same pot, combine 1 cup sugar and 1 cup water. Bring to a simmer then add the lime slices. Simmer for 20-30 minutes or until the white pith becomes translucent. The thinner your slices the quicker this will happen. Remove the lime slices and place on a cooling rack to drain and dry for a couple of hours. Place the extra sugar on small plate. 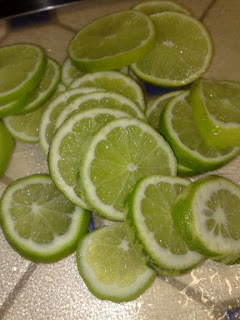 Once the limes are dry coat both sides of each slice with sugar. You may need more sugar. Store in an airtight container, with greaseproof paper in between the layers to stop them sticking. The slices can also be frozen. 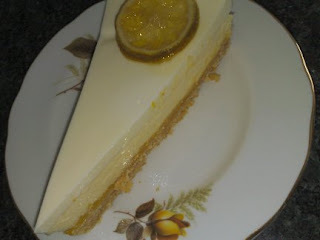 Yum - I love citrus and cheesecake, so all in one, it's sure to be a winner.